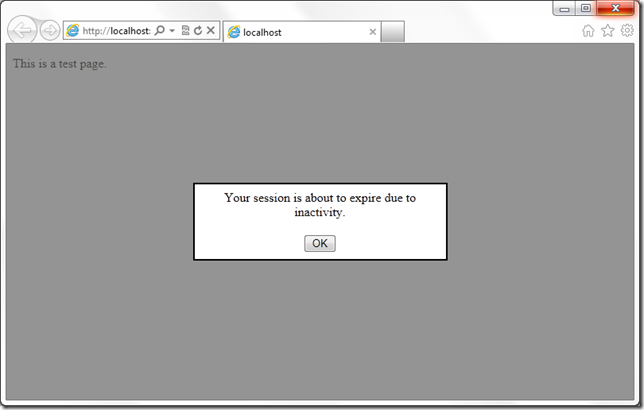 The ASP.NET AJAX Control Toolkit offers an extender that we can use to easily show popup boxes to the user. In another post I showed how to install ASP.NET AJAX Control Toolkit. In the last post, we used alert() to let the user know that her session was about to expire. We’ll make a few changes to show an AJAX modal popup. First, let’s add a ScriptManager, a ScriptManagerProxy, or a ToolkitScriptManager to the page. Add a Panel and a ModalPopupExtender to the page. We also need to add an hyperlink. It will not be visible to the user; it’s just used to fill the TargetControlID property of the extender. Also add the following CSS. You can add it to a .css file. For this post, we’ll put it in the page itself, inside style. When the popup is shown, there will be a div below that will fill the whole page. With the modalBackground class, we make that div semi transparent. We use the $find function to locate the extender and show it or hide it. As in the last post, the minutes for each timer are read from the web.config. Add this to the web.config. We use only 1 and 2 minutes for each timer. That’s all, run the web application. After a minute, you’ll see the popup.